Deliver relevant self-service content based on a customer’s context. Provide engaging, step-by-step content using Guided Paths. 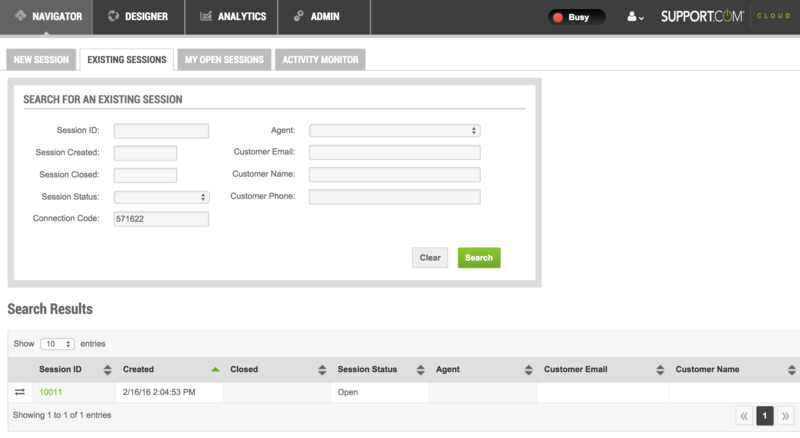 Provide a seamless escalation to live agents via instant web chat or phone call. Initiate co-browsing of a customer’s browser, to see what the customer is seeing. This guide is intended to assist software developers who want to embed Support.com Cloud SDK into their websites and web applications. A Guided Path (GP) is a set of instructions (/steps) that an agent &/or consumer can follow to fix a technical support issue. Support.com Cloud allows you to use a single Guided Path for both your agents and customers, or customize the content for each audience. If/when your customer transitions from Self-Service to a live agent, your agent will be able to view all of this context as well as all of the consumer’s Guided Path activity. 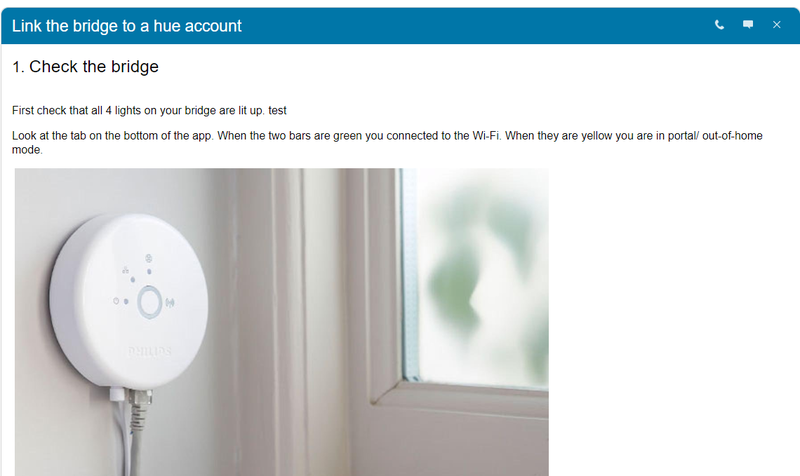 If you logged the consumer information, then a consumer record is automatically created in the system. 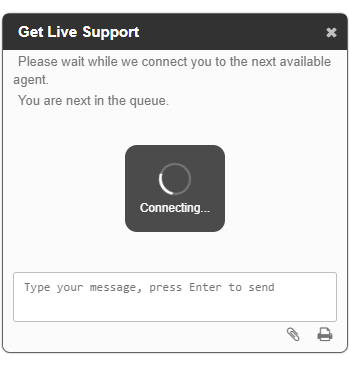 As mentioned before, Self-Service screens shown by Support.com Cloud SDK, will also allow your user to reach out to your agents via a single click on Live Help. When the session transitions to live help, your agent will be able to chat with the customer and co-browse their browser, all from within your application. Goto Admin > Integration > Application Tokens. In Audience select Client Apps and REST APIs. Two ways can be used to integarte Support.com Client SDK in your app. If your app does not permit script (especially external libraries) to be executed in the body of support article, you can include a iframe element in your app, it dynamically loads based on the parameters passed in. This approach works well on a small scale to implement specific articles and gets around the security requirements because the iframe is served over HTTPS. By passing in searchtype, searchvalue, displayorder and JWT, it can work for any tenant. searchtype defines the type of guided path you want to search, it can be one of these 3 values: helpid, tags or text. searchvalue defines the value of your defined type you want to search, when you searchtype is tag, multiple values can be set here seperating by comma. phone, skill, remoteConnectionType are optional, they should be set when you set contact_us in displayorder parameter. The code will need to be included in every page where you intend to use the Support.com Cloud functionality (including cobrowsing). This initialization must be invoked BEFORE ANY OTHER API CALLS. You should invoke this API from any page where you will be using the Support.com Connect SDK. The initialize API accepts one argument, an application token, which is used to authenticate and authorize your application with Support.com Cloud server. Use JWT Application Token generated above. 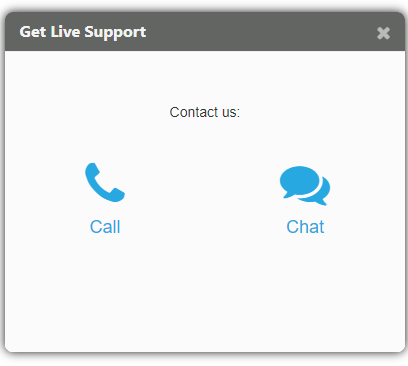 Live Help integration provides an easy way for your customers to reach out for assistance via a chat dialog or a phone call. After SDK is initialized, the widget can be binded to any HTML element of your choosing. It is completely up to you where you want to place the widget (i.e. in-line with some other HTML or in a pop up dialog), as well as how you choose to style it. The only requirement is that the widgets needs to be in a container with width and height of at least 300 pixels each, in order to fit all of the content. Option three is selected by default. You can opt-in for option one or two by specifying mode key/value pair in the options object. Let customer choose between Chat and Phone Call option This is the default behavior and mode key can be omitted with the same result. There are additional configuration steps required for both Chat and Phone Call options and they will be covered in the following sections. After the Phone Number is specified, the customer would be presented with a window offering to get support via phone. If customer will select this option, they will be presented with the following window. When customer calls the phone number specified through the SDK, they can provide the agent with the connection code (i.e. 571622 in the image above). 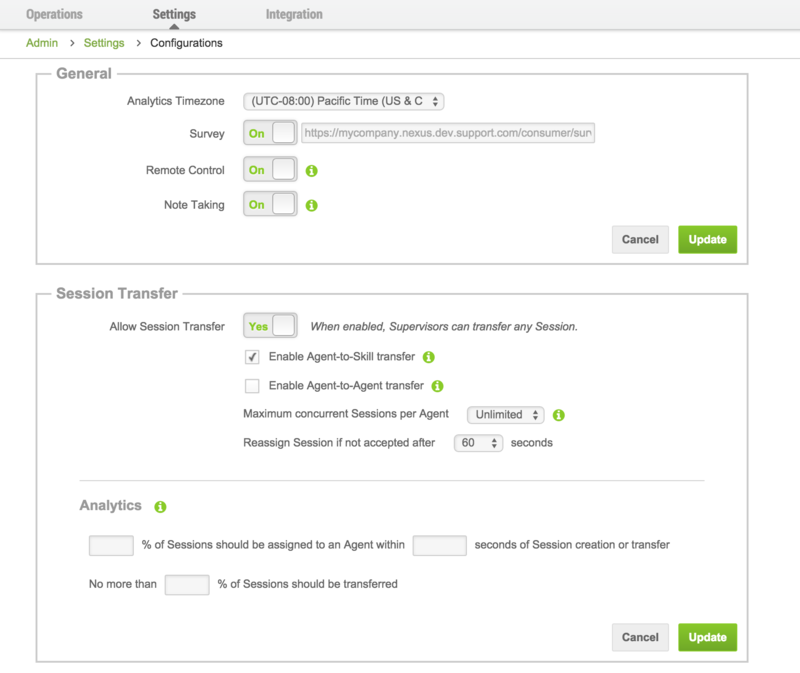 The agent can navigate to Navigator > Existing Sessions view, and search for specified session via the “Connection Code” option. 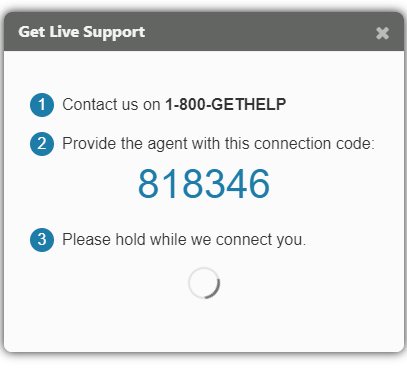 If your company uses Interactive Voice Response (IVR) technology, step 2 in the phone call message can be update to display “When prompted, enter this connection code:” instead of “Provide the agent with this connection code:”. Which will result in a connection window that looks as follows. Few things need to happen, in order for Customers to be able to chat with an Agent. New session gets created and added to the queue, identified by a particular skill (explained below). Next available agent marks himself or herself as available. Finally the session in the queue gets assigned to the available agent. 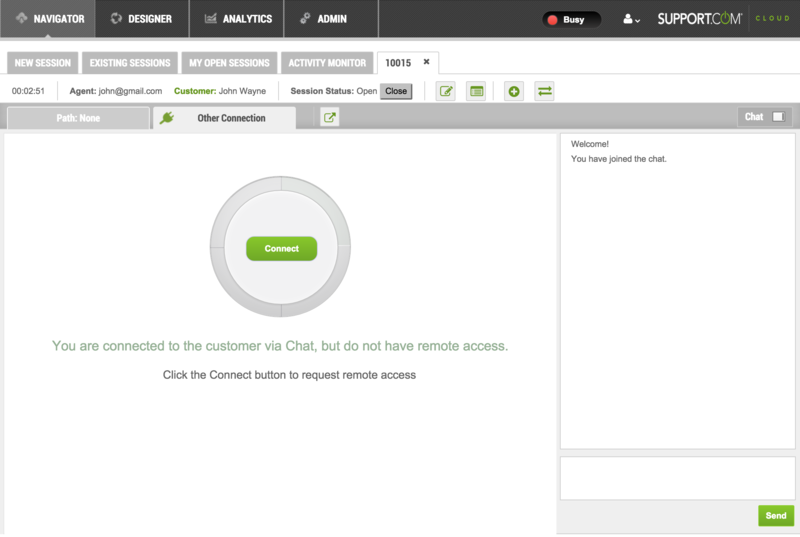 As a result, there are few additional configuration that need to take place for the chat integration to work. If session is not being assign to a particular agent, it can be assigned to a skill instead. “Skill” here simply means a sub category of sessions. For example, some customers might request help while trying to make a purchase, while other might require technical support. Having different “skills” specified for different chat integrations, will allow them to be directed towards the right agent. Navigate to Admin > Operations > Skills. Click on Add New [skill] button. Fill in a name for a new skill (i.e. sales). Choose Agents that you want to get assigned to that skill in “Available Users” view. This step can be performed at a later time by editing a specific user or skill. 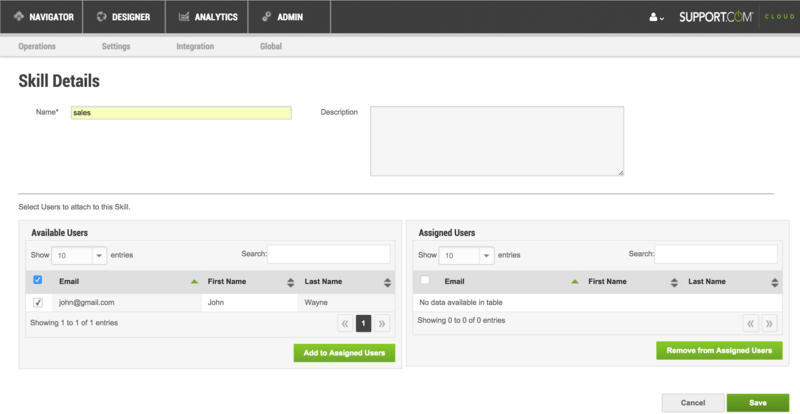 You can add or edit agents by navigating to Admin > Operations > Users. Click on Add to Assigned Users button. Next “Session Transfer” functionality needs to be enabled in order to let Agents mark themselves as available. Navigate to Admin > Settings > Configurations. Under Session Transfer select Allow Session Transfer as Yes. Select Enable Agent to Skill Transfer. Click Update button under Session Transfer section. Log out and log back in to the product as an agent with the proper skill assigned. You should see the “Agent Status” toggle in the top right corner. Refresh the page with the chat integration. If everything went well, you should see the chat window that looks as follows. Now if you go back to the main App and mark yourself as available via the “Agent Status” toggle, you will get a notification prompting you to accept the new session. From there you will be able to chat with the customer. Refreshing the integration page should result in the following window, allowing customers to request help via phone or chat. Through in tab only co-browsing experience (no installation required). Through a full control over customer’s computer (customer will be required to download and install a remote connection client). The co-browsing mode is enabled by default. You can also set it manually via: remoteConnectionType: "cobrowse" setting in your SDK configuration. To enable full control over customer’s computer, set up your SDK with remoteConnectionType: "remote" option instead. 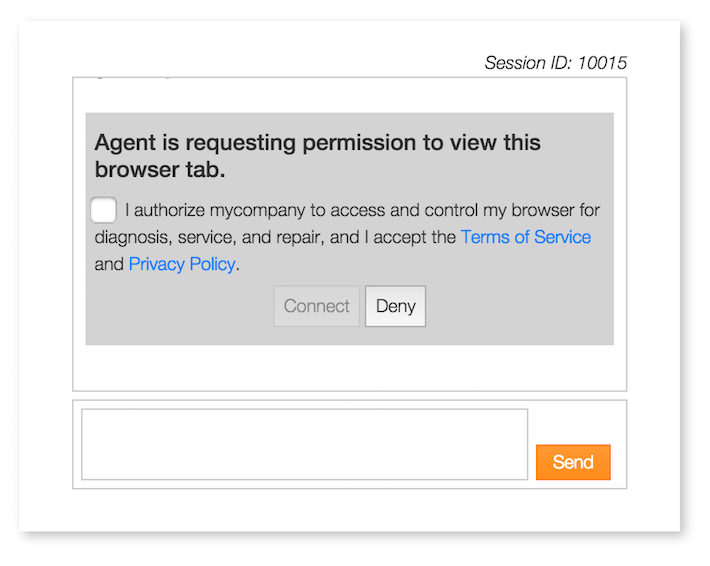 In case of cobrowse connection - Content of customer’s browser tab will instantly become visible to the agent. In case of remote connection - A download of remote connection client will begin. Customer will need to open the downloaded file, and wait for the remote connection client to install. After installation is complete, agent will have full control over customer’s computer. Saving it into an index.html file. Serving it with your favorite web server of choice. For example, if you have npm, you can install simple http server via npm install http-server -g and call http-server from the root of the directory where index.html is saved. You can control both the visibility and ordering of these components in your self help pages. You should invoke these APIs before invoking showSelfHelp. setDisplayOrder() : This API expects an array of components that governs which components will be shown and in what order. If this API is not invoked then all the components will be displayed. setContactUsOptions() : If you include Contact Us component in your Self Help site, you can control the Live Help behavior using this API. To display call option, set the phone number. To display chat option, set the skill. You can also control the remoteConnectionType. Resize - In case an embedding application wants to resize it’s height based on the loaded content height then you should register your callback handler to onSelfserviceContainerHeightChange. Callback handler passed to this method is invoked whenever content height is changed. The chat methods enable you to develop a new chat UI altogether. The skill group is required, unless you are implementing you’re own queuing. 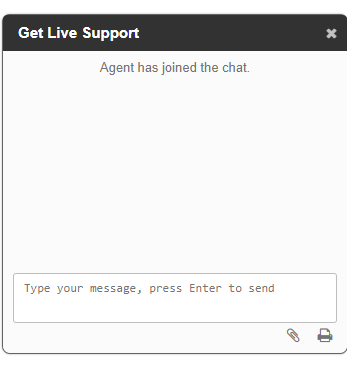 Sending a message (to an agent): Now that you’ve started the chat, you can now send messages to an agent from the chat. Note: It’s best to set on listeners before starting the chat as some events can fire before you start (such as populating previous messages after a user reloads). *When a user reloads, the previous messages are also fired on load as message events. A user’s identity context generates a corresponding consumer within Support.com Cloud. All calls accept a single string argument. If you want to preserve this context data between each session, call NexusConnectSDK.preserveContext(true). before the self help and assisted service api calls. Logging / data: The context APIs also provide support for logging actions, device information, or content information about a user. Each call accepts a string for a key name and an optional object or primitive for the data value. The theme is implemented using Cascading StyleSheets (CSS). It provides a powerful language to control every aspect of an element’s appearance. In-order to control the theme of selfservice container you can use the selfservice container css theme as a starting point. You can download a copy of the selfservice container theme, and build your own site’s theme by modifying it. In addition to the selfservice container css theme now you can control the theme of step contents as well. You can download a copy of the selfservice step content theme, and customize it based on the look and feel of your own site’s theme. You can configure the customizations using the Self-Support snap-in that is available inside the Support.com Cloud portal. NOTE: This option is only visible if Self-Support feature has been turned on for your site. If this option is not visible, please contact us at help@support.com. 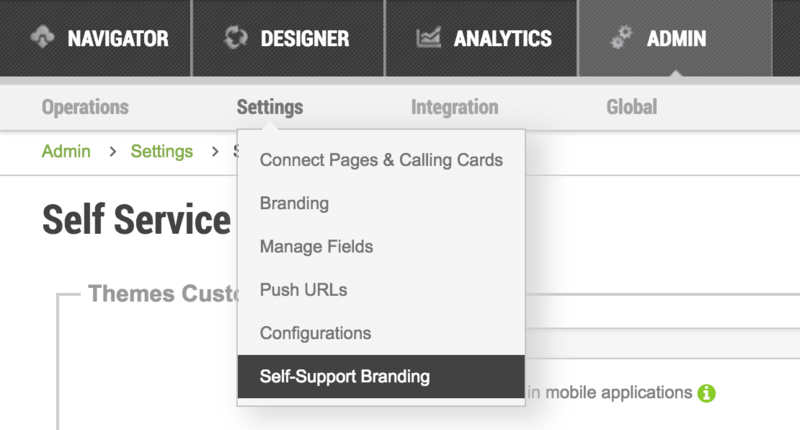 On the Self-Support Configurations page you will find a field labelled Theme URL and Step Content Theme URL. If you have hosted your theme CSS on an external server, you can paste the URL of the hosted CSS file in the field and click on the Update button at the bottom of the page. If you’d like to have your CSS hosted by the Support.com Cloud portal, you may use the Upload Theme file button adjacent to the Theme URL field to select your theme CSS file from your local computer and upload it. After applying your theme, if for some reason you want to switch back to the default theme, you can click on the Reset to default button to clear your custom theme and switch to the default theme. If you have uploaded your theme and want a copy of the uploaded CSS file, you can click on the Download Theme file button to download it. In case you do not want your custom theme to be applied to the Self Help site when opened on mobile devices, you can uncheck the Enable theme in mobile applications option. Once you are done with your changes, click the Update button to apply your changes. In the SDK, you can specify the URL to your theme file using the setCustomizationOptions() API. This API should be called before calling either showLiveHelp(), showSelfHelpForHelpId(), showSelfHelpForTags() or showSelfHelpForSearch() APIs. If this API is a called after any of them, the theme will not be applied. The CSS file must be hosted on a server which provides a HTTPS connection. If this is not considered, your user’s will receive a warning from their browsers that the page has loaded with secure & non-secure content. Which technique should you use to apply your theme? You are able able to embed the SDK inside your web site and there are no restrictions imposed by the site provider. You have multiple applications that integrate with the Live Help widgets or Self Help site and want to apply different themes for different applications. You are testing your theme and making incremental changes to the theme. You have an external hosting facility to host your theme CSS. You have finalized all changes to your theme and have tested it across all your applications that have integrations. You do not have an external hosting and want Support.com Cloud portal to host your CSS. You want a single point of control for all theming and customizations. Using the Self-Support snap-in inside Support.com Cloud portal applies your theme globally to all self help sessions created via any of our SDKs. Text content such as control labels, user messages, button captions, etc. can also be controlled. However, these can be customized from your Support.com Cloud portal. On the Self-Support Configurations page you will find a section titled Strings Customization. The section has a list of fields each representing static text content used on the Self Help site. Initially the default text content is displayed in the fields, you may modify any of the values and customize them. After customizing any values, if for some reason you want to switch back to the default value for that field, you can click on the Reset to default button adjacent to the field, to clear your custom theme and switch to the default theme. Note: This only appears on those fields which have been customized. After changing the values in the fields, you must click on the Update button to save your changes. We’ve put together a sample web application that uses all of the integrations mentioned in this document. To see the integrations, hover over Support + menu. Support 1 - Search box that performs a search by content and row of icons (domains, websites, email) that search by tag. Support 2 - Adds a row of buttons (domains, websites, email, ssl, linux) that perform search by help id. Support 3 - Adds a “Quick Setup Guide” link at the top, that performs a search by help id. Calling Card 1 - Live Help integration for Chat And Phone with Interactive Voice Response message. Calling Card 2 - Live Help integration for Chat And Phone with default message. An example of Interactive Voice Response integration can be found under IVR.